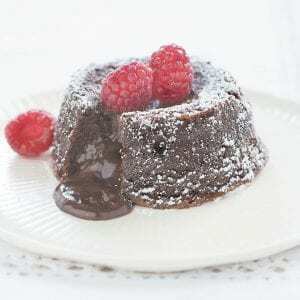 Fallen chocolate cake, or molten chocolate cake, is an undercooked in-the-center mound of intense, buttery chocolate cake. We wanted to turn this restaurant menu standard into a practical recipe for home cooks. Finally, we wanted to ensure that these decadent desserts would arrive at the table hot and still molten; happily, we found that we could prepare the batter ahead of time, refrigerating the filled ramekins until ready to use and then placing them in the oven to bake during dinner. You can substitute bittersweet chocolate for the semi-sweet; the flavor will be slightly more intense. For more recipes, cooking tips and ingredient and product reviews, visit www.americastestkitchen.com. Find more recipes like Fallen Chocolate Cakes in “The Perfect Cake.” America’s Test Kitchen provided this article to The Associated Press.